Dacorum & Tring AC had a fabulous finish to the 2014-15 Chiltern League cross country season, bringing home seven trophies and four team medals. The combined senior and vet ladies’ and girls’ team topped the tables, winning the Division Two title with 1,532 points, nearly 200 points ahead of second-placed Headington; while the senior ladies’ team placed second overall and the U13 girls’ team were third after five races. Samantha Fawcett and Kelly Du Buisson won the trophies for second and third respectively in the senior ladies’, while Catherine Davies was second in the VF45 category. On the men’s and boys’ side, Kristian Imroth took home the U13 first-place trophy for the season, having won all five of his races, while Jamie Bailey was second for the U11 boys and Rhys Rowlands was second for the U17 men. The U13 boys’ team shared silver medals for their strong season, while the U17 men’s team won gold. The club posted many fine performances at the final race, held at Teardrop Lakes in Milton Keynes. First up in the U11 girls race was 10-year old Olivia Edwards, who finished 10th overall. For the U13 girls, Maddie Perry was third and team-mate Indira Patel finished fourth, while Calypso Phillips was sixth for the U17 women. On the senior ladies’ side, Sam Fawcett finished sixth, followed by Ania Gabb (seventh), Kelly Du Buisson (12th), Catherine Davies (15th), Becky Fawcett (31st), Samantha Sullivan (33rd), Karen Wishart (35th), Charlotte Ashton (46th), Pat Hayball (55th), Denise Burford (61st), Kirsty Russell (67th) and Helen Reardon (74th). For the boys, Jamie Bailey, recently crowned Herts Schools county champion, was just pipped to the post, finishing second for the U11 boys, with Thomas Ashton in 27th and Sam Burnell in 35th. Kristin Imroth won his fifth straight race for the U13 boys, with Nico Dowsett finishing fourth. Matt Renphrey, meanwhile, posted a strong third place finish for the U17 men. The senior and vets men’s team finished third on the day, only 22 points off second place. The team was led home by Jamie Marlow in sixth position, followed by Matt Salt (27th), Duncan Hamilton (33rd), Chris Marriott (36th), Steve Russell (42nd), Russell Morris (49th), Simon Walker (51st), Matt Hamilton (52nd) and Richard Slack, Keith Wishart, Rob Salt, Michael Lamb, Richard Belsey, Darren Mills, Martin Kerr, Paul Glyn, Casper Du Buisson, Dave Stears, John Slack, John Cooper and Malcolm Sargent. Tring Running Club have clinched promotion to Division One of the Chiltern League after pipping rivals Headington at the last race of the season. Going into the final meet of the campaign at Teardrop Lakes in Milton Keynes, there were only a few points separating Tring and Headington, but it was Tring who dug deep to seal promotion. Not only did the club win the division, they also had some excellent individual results and category results based on the five races. The men’s team took first place, with the vet ladies also finishing first. The ladies were second in their category, as were the men’s vets and the U17 boys. Mary Moo, Dom Evans and Michael Burgess all took third place in their respective individual categories, but the stand-out performer was Luke Delderfield who was first in both the senior and overall men’s sections. Tring captain Rick Ansell is pictured in action. Gade Valley Harriers fielded a strong team of 21 men and 10 ladies in the last Chiltern League Cross Country fixture of the season at Teardrop Lakes. The Harriers finished more than 400 points clear of the relegation zone during their first season in the hotly contested Division One. 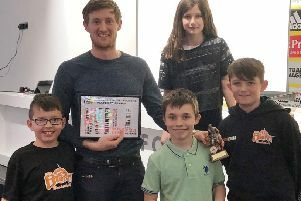 The club’s remarkable achievements were made even more so by the fact that they are the only team in Division One to compete without any junior teams to score points. Ladies’ captain Gemma Bitaraf said: “I’m exceedingly proud of GVH, an amazing achievement everyone! Men’s captain Ed Price echoed these sentiments, adding: “One of the reasons behind our success is the sheer numbers we put out at each fixture. Meanwhile, the Harriers are also busy with the preparations for their 17-mile marathon training run on Sunday, February 22. The second of three training runs, the Harriers expect around 500 runners from all over the country to attend the run as part of their training for their spring marathons. The runners will be set off at 9.30am and head out along the Grand Union Canal towpath, before going towards Potten End, round the beautiful Ashridge Estate, and heading back to Potten End. Elsewhere, Sam Tucker – in preparation for her 10 marathons in 10 days charity challenge – completed a 33-mile run on Saturday, followed by another 33 mile run the next day. Taking part in the Pilgrims Challenge, Sam completed the mammoth journey as part of her training for the Brathay 10-in10 Endurance Challenge in May. The last round of the Chiltern League on the same day meant that numbers were lower than usual at Tring parkrun and, for a change, there was no severe weather to report. UK marathon runner Claire Hallissey set a new female record of 20:34, beating her previous record by a few seconds – meaning a female was the fastest finisher for the first time. Behind Claire, Rosanna Iannone of Vale of Aylesbury AC was second and also set an age category record, with Ellie Smith in third. Only 16 people first time Tring runners were in action this week, with 61 per cent of those on the course setting a personal best, some by considerable margins. Of those who have done five or more runs, Michael Fryer took 2:08 off his previous best; Katrina Bond 1:52; and Paul Myatt set his fifth PB in a row. Guy Dauncey was the fastest male followed by Rob Fletcher and Ian Needleman. The fastest juniors were rapidly improving Michael Fryer, Reece Wilcock and Michael Reeve. The parkrun is for all ages and abilities, and times ranged from 20 minutes to 43 minutes – with an average of about 30 minutes.